So what are you doing this New Year's Eve? Probably staying up past midnight, having dinner and/or libations with friends or strangers... but I'll bet no matter what you do, it will not be nearly as geeky as this party from back in 1853. That, my nerds, is a dinner party is held inside a life-size model of an Iguanodon. 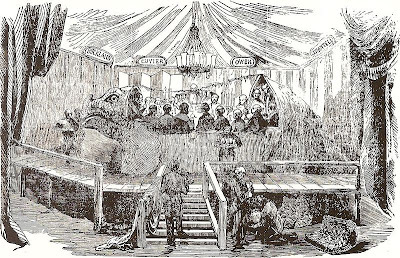 Although it is often claimed that a dinner was held inside the Iguanodon, in fact the dinner was held inside the mould that was used to make the large sculpture. Curious about what one eats when sitting inside a dinosaur? Apparently, it was quite the feast: 7 courses including soups, fish, removes, entrees, game, sweets, dessert and an assortment of wines. These scientists really knew how to party. You can check out the entire menu over at The Old Foodie. Now over time the accuracy of the sculptures has been contested over and over again, especially as new fossils have been discovered. However, despite their innaccuracies, they have been restored and are still on display at Sydenham Crystal Palace Park. Regardless, they might just be the site of the geekiest New Year's Eve EVAR. How do you think yours will stack up? Happy New Year, nerds! See you for more geeky goodness in 2013.